Students present their 3D models of plant and animal cells. On most days, Rebstock 215 lecture hall is full of Washington University undergraduate biology students. One night a year, teenagers from all over the St. Louis region fill the room. They listen diligently to associate professor Ram Dixit’s lecture on how cells get in shape. 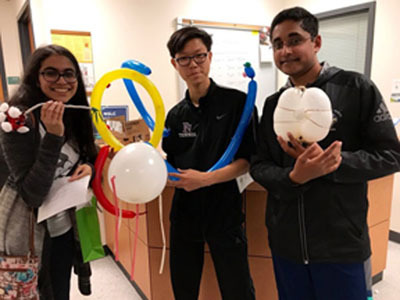 Forty middle and high school students participated in the most recent Teen Science Café in March 2018. The event is organized by the Academy of Science of St. Louis and hosted by the Biology department. Teen Science Café is a hands-on event. A winning team used different materials to create the 3D shape of a nerve cell. First, Dixit introduces the students to the cytoskeleton, the internal structural elements of the cell. These polymers confer cell shape like columns and beams define the shape of a building. Then the students are challenged to replicate the 3D shape of one plant cell and one animal cell. “They have to think about how they will use materials with very different mechanical properties to build something that has a particular shape,” Dixit said. 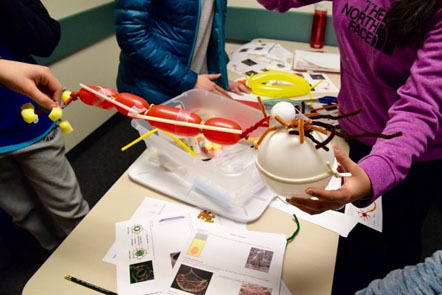 With a box full of materials, a handout depicting animal and plant cells, and an objective to understand how cell shape formation works, the students set out to conduct an experiment. First, they make a plan. “This is your hypothesis,” Dixit tells the students. The next step is to test the hypothesis by doing the experiment. Pipe cleaners and straws transform into nerve cell projections. Balloons simulate the turgor pressure that gives a plant cell its shape. Some plans fail. Those teams have to alter their hypothesis and conduct a new experiment. Other middle and high school teens serving on The Academy of Science STEM Teens Youth Leadership Council help competing teams with the activity by offering advice to their peers. Dixit visits with all the teams to provide guidance. Students vote on the winners. This year, models of two neurons – the cells of the brain – and an epithelial cell – a columnar cell that is part of the tissue that lines the gut – won. Each winner received as a prize a kit of laser cut wooden pieces that assemble into a microscope. Dixit joined the faculty at Washington University in 2008. He and his research team study the mechanisms underlying cell shape formation. He is fascinated by the proteins polymers that make up the cytoskeleton and wants to understand how they determine cell organization, shape, and function. “I think that if everyone had some understanding of cell biology, we wouldn’t have such a problem with funding basic science,” said Dixit. He is committed to engaging young people in science because he wants to break the disconnect between the public and the scientific community. And because it is fun!